IRRI India - Non Profit Organization of better rice varieties research services, rice and the environment research services & training center service in New Delhi, Delhi. 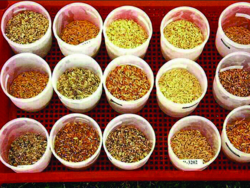 IRRI develops rice varieties for the benefit of rice farmers and consumers. We conduct research and training to improve rice for better grain quality and higher yield, resistance to pests and diseases, tolerance of environmental stresses, and less farm input requirement. 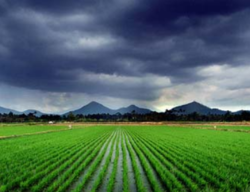 We focus on the major rice ecosystems: irrigated, rainfed lowland, and upland systems. We employ conventional breeding and new tools in genetics and genomics—such as marker-assisted selection—as well as genetic modification.We develop genetically superior and elite rice breeding lines and hybrid varieties. IRRI shares these breeding lines with our research and extension partners in rice-producing countries. We are part of the International Network for Genetic Evaluation of Rice (INGER) that facilitates the evaluation and multilateral exchange of rice products and information including elite breeding lines. This helps our partners develop varieties in their own breeding programs. To date, IRRI has produced 843 rice varieties that have been released in 77 countries. IRRI's rice breeding work is part of the Global Rice Science Partnership (GRiSP), Theme 2: Accelerating the development, delivery and adoption of improved rice varieties. IRRI’s crop and environment research develops better management options for rice farmers to make rice farming more productive, eco-friendly, and resilient to climatic extremes and other challenges. We study rodents and other pests, diseases, and weeds as well as soil, nutrient, and water management. We investigate practical and affordable mechanization options and management practices to ensure diversified rice cropping systems—where rice is grown in rotation with other crops—are sustainable. We design cropping systems adapted to climate change and find ways to reduce emissions. We develop new and adapted management strategies needed to accompany the introduction of new rice varieties better able to cope with drought, submergence, and salinity. Our research will lead to the development of more ecologically sound management principles and resource-conserving technologies that support the further intensification and diversification of rice systems, particularly in Asia. In Africa and Latin America, where there is more land and water available for growing rice, our work will help ensure growth in rice production is sustainable. IRRI’s crop and environment research is part of the Global Rice Science Partnership (GRiSP), Theme 3: Ecological and sustainable management of rice-based production systems. For five decades, IRRI has provided a place for scientists and future leaders in rice research to learn. Since 1964, over 15,000 scientists have undergone training at IRRI to conduct rice research. The IRRI Training Center includes a 40-person mini-auditorium equipped with several computers with Internet connection, a 35-person activity room, and a studio room for recording and video-editing purposes. The Center is housed in M.S. Swaminathan Hall, formerly known as Dorm IV, and was completed in 1985. It houses the Training Center on the first floor and the upper floors serve as a dormitory for scholars, trainees, and other guests. The building was named after Dr. Monkombu S. Swaminathan, a former Director General of IRRI (1982-1988), and was dedicated on 21 December 1987.